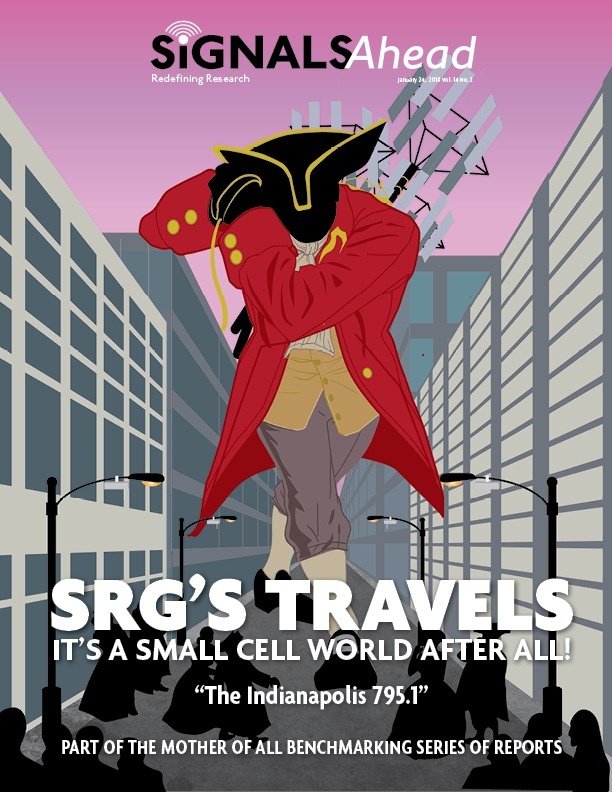 SRG conducted its third benchmark study of small cells. For this round, we turned our attention to LAA (Licensed Assisted Access) and the AT&T network in Indianapolis, Indiana where Ericsson is the infrastructure supplier. This trip marked the third time we’ve been to the city – once before small cells (May 2017), once after AT&T had deployed a limited number of small cells (Sept 2017), and, most recently, after AT&T had deployed a significant number of small cells with LAA functionality. Our Methodology. We used FTP downlink full buffer (1.6 Gbps FTP server) and various user experience tests (Google Play, Google Drive, etc.) to generate data traffic while walking and driving around the downtown area. We used both time-based and geo-binned data for our analysis of the network, comparing results for each test period, as well results between mobility and pedestrian testing. A Must Read. This report is a “must read” for any organization interested in the incremental benefits that small cells, including small cells with LAA, have on the user experience and overall network efficiency.